If you are looking for the best laptops for business users, this is the place you’ll find them. The requirements of business individuals when it comes to buying a laptop for their work are very uniquely different from other purposes. When it comes to gaming, editing work or animation, there are several overlaps that occur such as high performance, great display, inbuilt cooling feature etc. For business purposes, all you need is a decent machine that can run tasks smoothly. At least that’s what comes to mind when you think about it. However, there are other aspects to look for too such as portability, battery life, versatility etc. If your need is to only get a laptop for strictly work-related purposes, then you can just buy an affordable one with basic features. If you often travel a lot on your job, then you need to consider other features such as a good battery life for performing tasks on the go, lightweight body so that it’s easier to travel with. You can also look for laptops that come pre-installed with Microsoft Office if your job requires you to create lots of documents and spreadsheets. Affordability is also another very important factor especially if you are only looking for a laptop purely for work-related tasks. Though requirements vary from one individual to another, it is always crucial to buy a laptop that offers a little bit of versatility. The last thing you want is to quickly buy one only to realize later that you can’t perform a number of tasks that you didn’t think about before. Therefore, it is always wiser to buy a laptop that is affordable but versatile too. In the below list, you will see a wide range of laptops that have their own unique strengths and features. You can browse through the list and find one that would suit any and all requirements you may have. From the best 2 in laptops to beastly powerful machines and very basic ones, you will be able to find the right one for your needs. 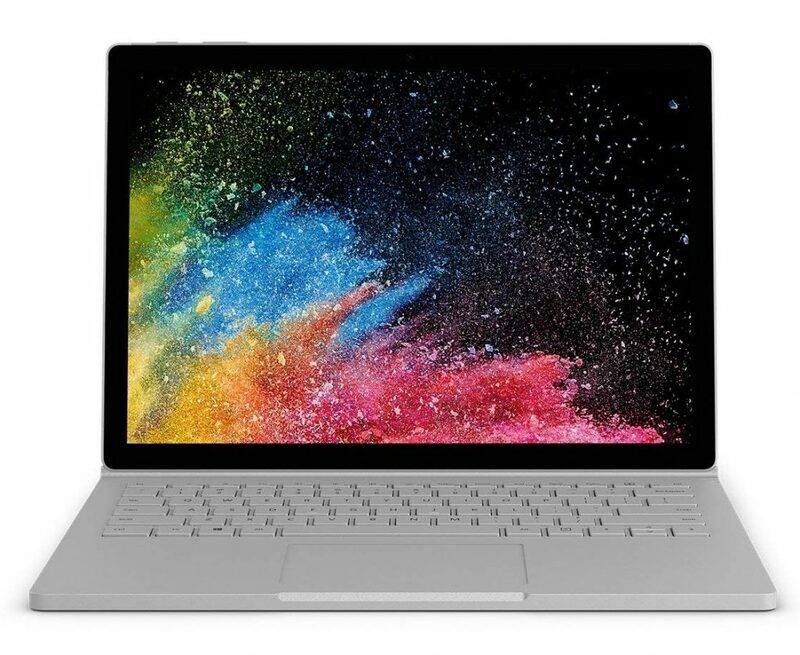 The Microsoft Surface Book 2 is perhaps the most powerful 2 in 1 laptop in the world featuring a jaw-breaking 4.2 GHz Intel Quad Core i7 processor, 16 GB RAM, 1 TB storage capacity, NVidia GeForce GTX 1050 graphics, Bluetooth BT4.1 LE and a stunning 13.5 inch display screen with a resolution of 3000 x 2000 pixels. The Microsoft Surface book 2 looks incredible with its ultra-thin aggressive external body and metallic grey finish. It’s more lightweight and thinner than the previous incarnation. You can even detach the screen to turn it into tablet mode. Moreover, you get to hear a very satisfying click every time you take off the display. Where it really shines is how it feels when you hold it. It is truly one of the thinnest and lightest 2 in 1 laptops out there today. One great aspect is that if you are using any application or program that requires dedicated graphics, it will ask you to save your work if you try to detach the display. The fulcrum hinge allows you to turn your screen around providing you with a truly versatile viewing experience. Performance wise, the Microsoft Surface Book 2 is the emperor of 2 in 1 laptops with its Intel Core i7 processor with a whopping 4.2 GHz processing power, 16 GB RAM and NVidia GeForce GTX 1050 graphics. It not only kills all the other 2 in 1 laptops but it actually surpasses a large number of gaming laptops too with its insane performance. This is not a gaming laptop by any means but it sure is very impressive for a hybrid. However, it’s important to note that when you convert it into tablet mode, its gaming performance level drastically drops since it can’t use the dedicated graphics. When it comes to office or work-related tasks, it will blaze through everything like molten dragon fire. Another great aspect of this laptop is its battery life. You get an astonishing 17 hours of video playback without the need to charge. With heavy tasks running, it lasts for nearly 6 hours which is impressive although not as much as the 7 hours on the 15-inch version. In tablet mode, it runs for 4 hours with medium to high usage. All in all, the Microsoft Surface Book 2 is the best all round 2 in 1 laptop in the market today bringing incredible versatility and usability. What makes it the best? The design looks incredible with its aggressive, sleek and ultra-thin body. You can detach and attach the screen to switch between laptop and tablet mode which makes it a very versatile device. It provides incredible performance with its 4.5 GHz processor, 6 GB RAM and NVidia GeForce GTX 1050 graphics. It has great battery life allowing you to use the device for up to 17 hours with medium usage. You can buy additional accessories such as the Surface Precision Mouse, Surface Pen and Surface Dial for additional usability features. 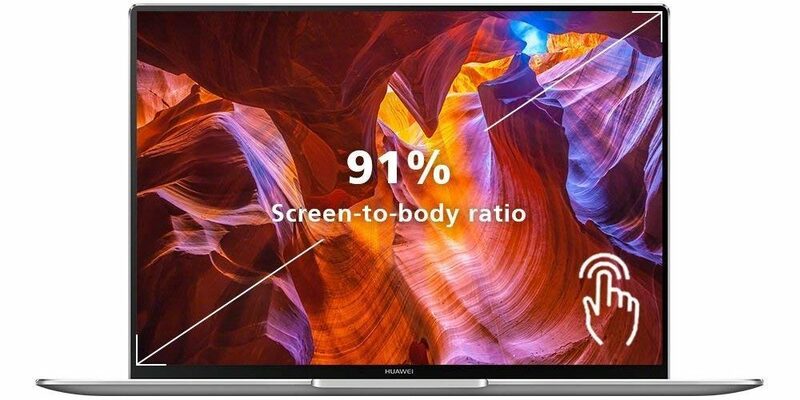 The Huawei Matebook X Pro features the 1.6 GHz 8th Gen i5 8250U processor, 8 GB RAM, 256 GB SSD, Microsoft Office 365 Personal, 13.9-inch display with a resolution of 3000 x 2000 and 260 PPI and weighs about 2.93 pounds. Right out the gate, you can see how stunning this laptop is with its ultra-thin sleek body with diamond cut edges and metallic finish. It is truly breathtaking to look at. You always want your business laptop to look professional and not be too gaudy and that is exactly what you get from the Matebook X Pro. You can spend hours just admiring this beautiful laptop and you won’t feel the time gliding by. While the exterior of the laptop is absolutely gorgeous, what is inside is spectacular too. The 8th gen Intel i5 8250U processor along with the 8 GB RAM lets you slice through tasks like a hot knife on butter. This version is nearly 40 percent more powerful than its predecessor which in itself speaks volumes about what this machine can do. When it comes to business tasks, you don’t have to worry about a thing due to its incredible performance. Moreover, you also get a complimentary subscription of 1 year for Microsoft Office 365 Personal Edition which just adds to the value you get when you buy this laptop. The HDMI, VGA, USB-C and USB-A ports also provide additional usability for both work and travel. Apart from its great performance, you also get a robust battery life of up to 12 hours of video playback, 14 hours of work based tasks and 15 hours of web browsing which is spectacular. If you travel a lot in your line of work, then the Huawei Matebook X Pro is your ideal companion. One great feature about this laptop is its recessed camera that pops up only when you need to use. Unlike traditional laptops, the camera is housed at the top of the keyboard. Online privacy is extremely crucial these days since we know that hackers can easily get into our laptops and use the camera for their gain. Having a recessed camera allows you to stop worrying about your personal privacy being infringed by online criminals. All in all, the Huawei Matebook X Pro is one of the best options you have when it comes to business laptops today. It is easily one of the best-looking business laptops in the market today with its stylish ultra-thin metallic body. 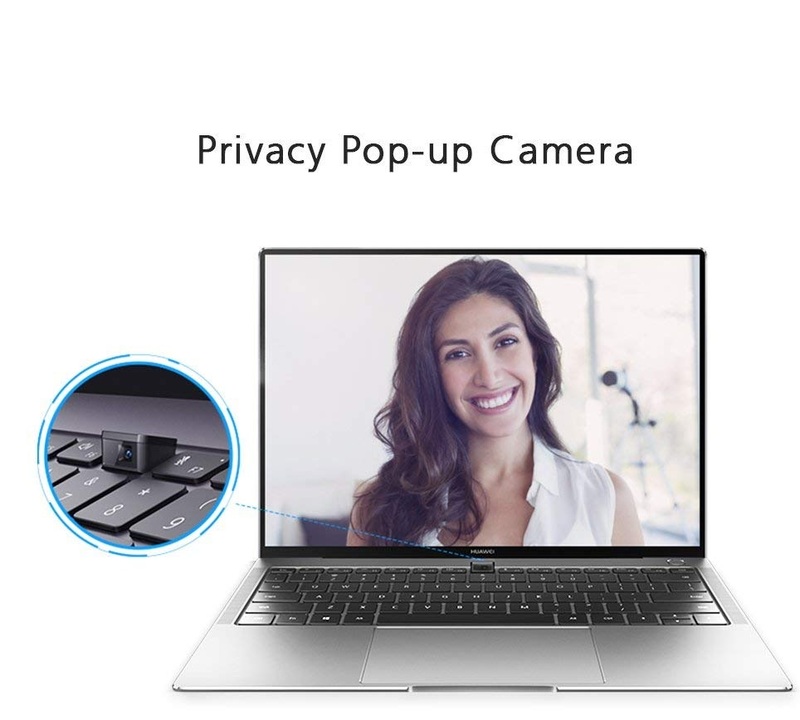 It comes with a recessed camera located on the keyboard that pops up only when you use it making it one of the most secure laptops in the market today when it comes to personal privacy. The i5 Intel Core 8250U processor and 8 GB RAM allow you to perform any business tasks with extreme ease and zero hassles. It also comes with a year’s subscription of Microsoft Office 365 Personal Edition which is very handy for business people. 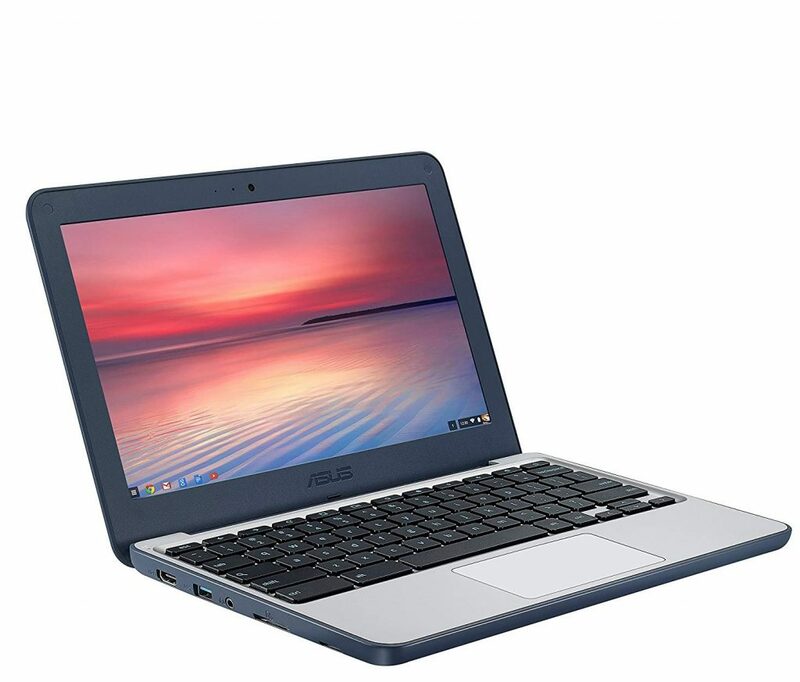 The ASUS Chromebook C202SA-YS04 comes with a 1.6 GHz Intel Celeron processor, 4 GB RAM, 32 GB eMMC flash storage capacity, built-in virus protection, 11.6-inch screen with a resolution of 1366 x 768 and weighs about 2.6 pounds. Design wise, the ASUS Chromebook looks pretty decent as aesthetics isn’t really its strong point. It’s nothing special to look at but it isn’t bad either. The core reason for this is that this laptop is marketed mostly towards children; however, some of its features are almost tailor-made for business purposes. What makes it an ideal business laptop are a number of different aspects. One reason is its spill-resistant keyboard. The ASUS C202 Chromebook can repel about 66cc of liquid and so you don’t have to worry about it getting splashed a little bit. Sometimes when you work in the office or at home, there is a chance of you spilling coffee or water on it since accidents do happen. Another great aspect is the good battery life of 10 hours allowing you to work unplugged for a long period of time. With low to medium usage, you can extend it by a few more hours easily. The laptop also comes with a tough rubber frame that covers all the edges which can protect it against small drops. It also comes with a very handy keyboard that has 15 percent larger character printed keys and 2 mm key travel for faster typing and better accuracy. This helps a lot by allowing you to increase efficiency with convenience and better usability. If your job entails you to make lots of documents quickly, this laptop is pretty much perfect for your needs. The two grips placed at the bottom of the laptop helps you to safely carry around your laptop without having it slip from your fingers and fall to its doom. The ASUS Chromebook C202 also comes with a 180-degree hinge that allows you to open up your laptop fully horizontal. It’s perfect if you want more than 4 people to see the screen at the same time. All you have to do is lay it on the table and open the display fully backwards to ensure that everyone can see what you are showing them. All in all, this laptop is made for rugged use and contains many features that help to protect it from accidental drops and spills, making it an invaluable product for business people. The 180-degree hinge allows you to have a more versatile viewing experience than traditional laptops. The built-in virus protection software helps to keep your precious data secure and safe from potential hacking and cyber criminals. The grips at the bottom, tough rubber casing on the edges and spill resistant keyboard make it an invaluable asset for a work environment. The 10-hour battery life helps you to work away unplugged for a long time or when traveling from one place to another. 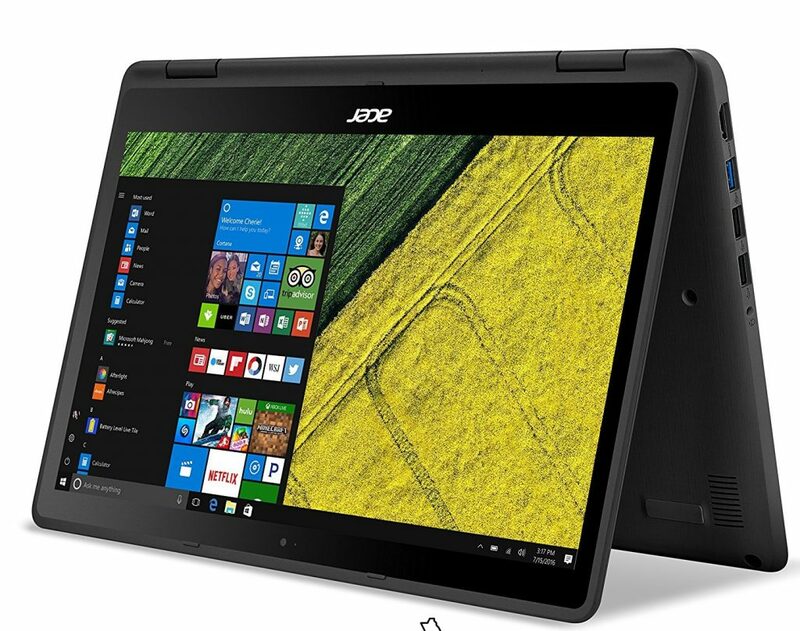 The Acer Spin 5 features a 3.1 GHz 7th generation Intel Core 15-7200U processor, 8 GB RAM, 256 GB SSD storage capacity, 13.3 touchscreen display with a resolution of 1920 x 1080 pixels and weighs about 3.53 pounds. The Acer Spin 5 looks very different from the usual ultra-thin 2 in 1 laptops you see in the market due to its thickness. It looks more durable and even feels that way when you hold it in your hand. The ability to transform it into 4 different modes gives it amazing versatility. These 4 modes are laptop mode, rest mode, tent mode and tablet mode. The laptop mode is when you use the device as a traditional laptop with the display upright whereas the display mode is when you push the display to 180 degrees making it parallel to the surface. You can also turn the display all the way back making the laptop look like a tent. This is ideal for watching content while lying on the bed or on the floor. It’s also perfect for viewing movies and videos on airplanes. Last but not least is the tablet mode where you bend the display to 360 degrees making it into one solid piece. All this can be done thanks to the 360 degree dual-torque hinges under the display. The 10-hour battery life and the latest 802.11 ac and MU-MIMO allow you to connect to the internet efficiently and stay unplugged for a long period of time. The 802.11 ac antenna optimizes the signal strength to provide you with flawless connectivity no matter what mode you are in. The laptop also comes with a backlit keyboard that allows you to work even in dim light environments. As far as display is concerned, the full HD resolution and the Acer Color Intelligence technology provide a vibrant and rich viewing experience. The touchscreen can support up to 10 finger interactions at the same time and allows you to seamlessly control functions with ease. You also get great audio quality with the built-in Acer TrueHarmony speakers that provide a fuller and more bolder sound. The 8 GB RAM and the Intel Core i5-7200U processor lets you perform tasks easily and quickly. All in all, the Acer Spin 5 is one of the best 2 in 1 laptops out there in the market today for business purposes. The 360-degree hinge lets you have an unparalleled viewing experience compared to a traditional laptop. The Intel Core i5 7200U processor and 8 GB RAM provide enough power to glide through work tasks with zero hassles. The display offers amazing vivid images and great clarity when it comes to video content. It feels more durable than most 2 in 1 laptops due to its thicker body which is great to see. The Dell XPS9560 comes with a 3.8 GHz 7th Gen Intel Core i7-7700HQ quad-core processor, 16 GB RAM, 512 GB SSD storage capacity, NVidia Gaming GPU GTX 050, 15.6 inch 4k Infinity Edge touch display with a resolution of 3480 x 2160 and weighs about 4.41 pounds. This is not your ordinary run of the mill business laptop. It’s a powerful beast that can be used for not only work-related tasks but even gaming and more intensive tasks such as editing or even small animations. The design of this laptop looks killer with its tiny bezels and very sleek design. It is cut from a single block of aluminum making it very durable and sturdy though it may not look like it. The Corning Gorilla Glass NBT 4k Ultra HD display looks gorgeous with its insane screen to body ratio. You could spend hours just admiring the beauty of this laptop and you will love every minute of it. When you take this laptop out, it’s guaranteed that heads will turn. 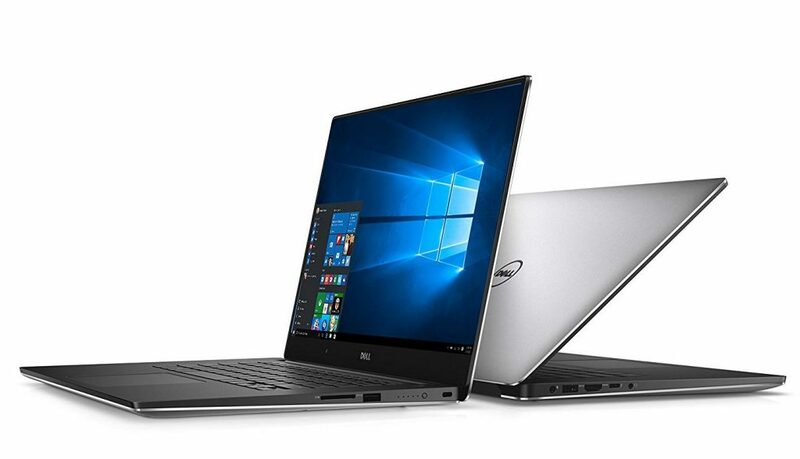 The Dell XPS 9560 also features the world’s first Infinity Edge display that maximizes the screen area by using a 5.7 mm bezel making it nearly 59 percent thinner than the MacBook Pro. It essentially fits a 15.6-inch display inside what feels like a 14-inch laptop. In many ways, it is the world’s most powerful lightweight ultra-thin laptop measuring at a stunning 1-7 mm. The 4k Ultra HD display also features nearly 6 million pixels more than the traditional Full HD display and 3 million more than the MacBook Pro. It is also the only laptop that comes with 100 percent Adobe RGB allowing you to see colors more vividly and boldly. 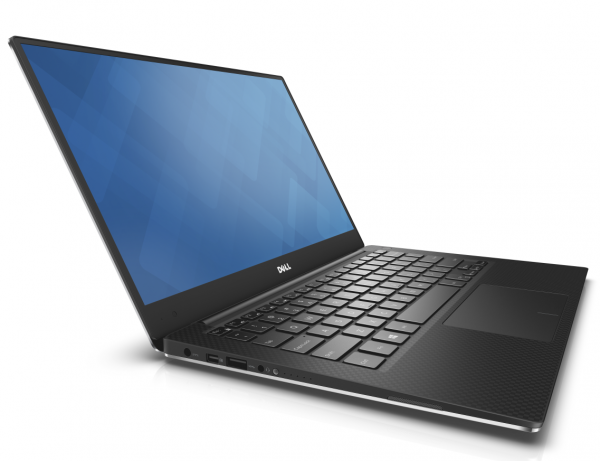 All these qualities make the Dell XPS 9560 an ideal laptop for graphic designers, video and photo editors. Another great aspect of this laptop is that you can do data transfers up to 40 Gbps due to the Thunderbolt 3 multi-use port and it can support up to two 4k displays. The performance capability of the Dell XPS 9560 is out of this world with the Intel Quad Core processor which can be overclocked to 3.8 GHz. No matter how intense the task is, it will glide through with ease. The design is absolutely gorgeous with its insanely thin bezels and stunning display. The Intel Core Quad Core processor and 16 GB RAM make this laptop an absolute beast with the ability to cut through heavy intense tasks in no time at all. Though it may look ultra-thin and delicate, the body is cut from a single block of aluminum making it incredibly durable. It’s also extremely lightweight at 4.41 pounds while being incredibly powerful making it one of the best performing thin laptops in the market. 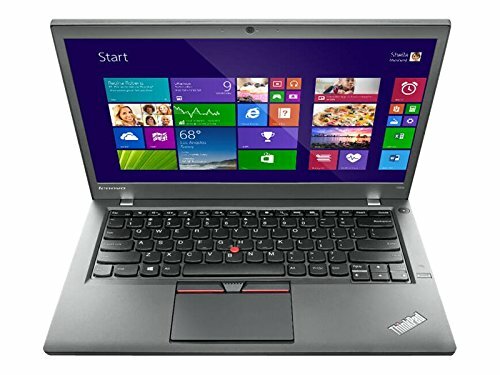 The Lenovo ThinkPad T450s is one of the costly laptops falling under the $900 range. Equipped with carbon fiber lid capable of withstanding huge bumps, this touchpad laptop will make any executive look like the geek of the office. It has 15.5 hours battery life, easiest navigation design, and the best keyboard in the industry. This 1600×900 pixel machine gives out crystal clear pictures in the 14-inch display screen. It weighs just 3.5 pounds and has 8 GB RAM. Running on a Windows 7 platform with Intel Core i7 4800MQ processor, this is considered as the best laptop for business use as it has several advanced features to provide mind-blowing presentations. If you are looking for a business laptop, this one is an excellent choice. It offers outstanding performance, its keyboard is comfortable and it’s battery last for a really long time, up to 18 hours. It is ultraportable because it is light, thick, and has a 14-inch display. 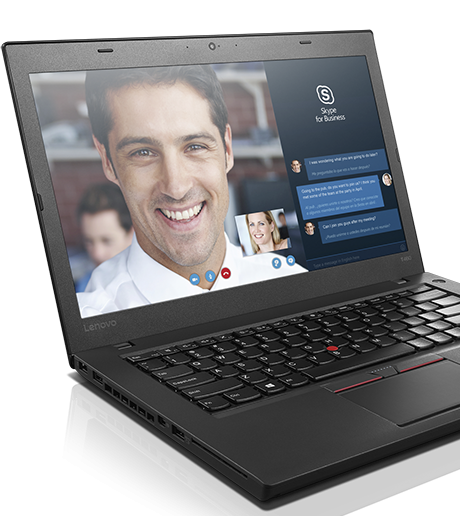 Lenovo ThinkPad T460 comes with various security features, including the fingerprint reader. This laptop is available in black color and it has Intel HD Graphics 520, 720p HD Camera and memory up to 32 GB. When it comes to the processor, the options are Intel Core i7-6600U, Intel Core i5-6300U, Intel Core i5-6200U and Intel Core i3-6100U. The price starts from $800. For more information about this laptop, visit Lenovo website. This business ultrabook has 1.9 GHz processor speed. It is great for graphics-based user research and presentation. Project work involving a number of files and huge images that can be managed very easily with this laptop. With 4GB RAM, you can keep up to 25 tabs open at a time and multitask enormously. 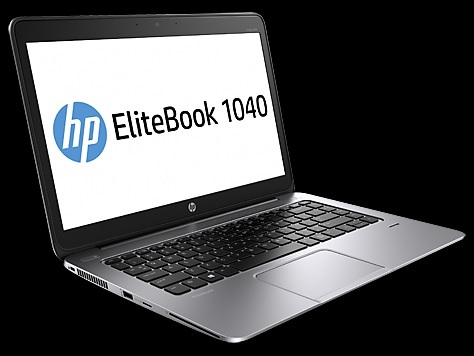 Though HP Elite is criticized for having low RAM capacity, most executives adore it, as one of the best laptops for business use owing to its extremely fast multitasking capacity. There is never a complaint about hanging up in the middle of a busy day. Agreed, it is not fit for managing huge share market monitoring software. But, it is the best laptop ever for normal day to day management with its Intel Core i5-4300U processes and 14-inch impressive display. It is one of the top seller models in the market due to its affordable cost and limited but sufficient features. As usual, Apple products rule the world because they are very simple and easy to use. Claimed as an ultraportable best laptop for business use 2016, this 12-inch MAC OS lap has 8GB RAM and 1.2 GHz processor speed. The Intel Core M-5 is ridiculed by other companies as being the slowest in the market today. But, none can match its long-lasting performance. 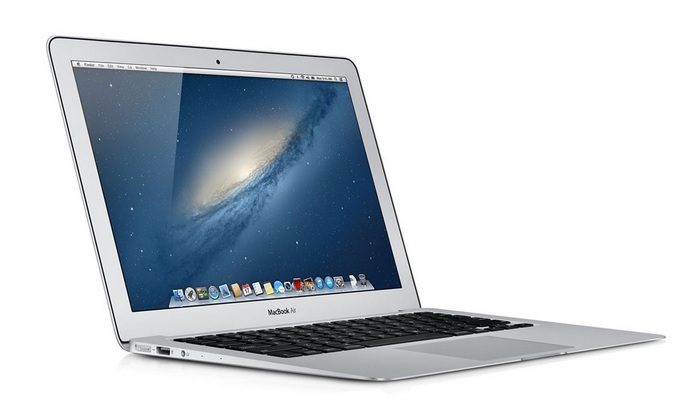 Many executives who work or head the R & D teams in various prestigious institutions select and recommend Apple MacBook for their team as it makes correlating data, creating infographics and creating graphs easier than any other laptop running on other OS. Most of us need the laptop all the time, no matter if we are at home, at the office or on the road. It is essential to have the ultraportable laptop which is light and thin. If that’s what you have been looking for, then Dell XPS 13 is the laptop for you. It has a 13-inch screen, it is light and it offers a battery life of 12 hours which is pretty awesome. The typing experience is excellent, and you can turn the backlighting on or off. It has an SD card slow and two 3.0 USB ports. With a 6 gen of Intel processor (several options to choose from), this laptop offers outstanding performance. For more information on this laptop, visit Dell official website. Finding the right business laptop is an easier task than you think. Unlike other purposes which require specific configurations, a business laptop only requires certain qualities like a professional look while being able to handle tasks efficiently. You don’t need a lot of RAM or an amazing graphics card in a business laptop. However, if you want a single laptop to fulfil not only your work-related tasks but also other requirements like gaming, watching movies, streaming content etc, then you need to look for a versatile machine. Not everyone can afford to have different laptops for different purposes. If you fall into that category, then going for a great all-around value laptop is the ideal thing to do. The above list comprises not only business-specific laptops but also some versatile ones and some very powerful ones. Once you have decided to go for any particular one, research a bit more by checking out a few user reviews on online retail sites and go for the one that best suits your needs.